When things fall apart, you can half expect some form of trouble-shooting to go down. Like the old westerns, the heroes stride into town, gather intelligence, draws guns at dawn and then saunters off into the sunset. In the world of computer hackers, the FBI browse hacker forums, recruit the best and the rest is declassified, possibly to be memorialised in a Hollywood film. However, with the NHS, well intentioned ‘heroes’ [read governments] often trouble-shoot in the wrong saloon, forget to consult the sage old bar managers or replace town sheriffs with bank managers. Envisaging and creating problems where there are few. For example, the latest changes to the NHS from the coalition government have given way to a deficiency in experience at the NHS – particularly in managers involved in strategic planning. The new organisations will take time to get settled, notably, new clinical commissioning groups that may not be able to keep a grip on systems such as finances. For instance, the NHS Institute for Innovation and Improvement is just one of the many bodies that helped the NHS to improve performance but is now being dissolved. Things may fall apart even further. Don’t let the mid-term reviews fool you. Besides being the title of the award winning African novel, when things fall apart is often the signal for trouble-shooters to start loading their pistols. But things aren’t always mended as soon as they fall apart. You live with my dad long enough you’ll realise that. You may also realise how long you can go watching Downtown Abbey with a blue hue on a broken TV, but that’s by the by! It is not necessary everyone accepts the miss-firings of the coalition government, then hold up badly hit targets to the towns’ people. However, one must work in the trappings of a democratic society and one suspect’s opposition leaders see no electoral benefit in this fight right now. Although Ed Miliband challenged David Cameron over NHS spending last month, a real fight may be some way away. Labour’s shadow health secretary Andy Burnham did slam the coalition’s record on the NHS but latest developments hint strongly at waiting for further mishaps from the coalition government before taking this issue up in earnest. What exactly will fall apart even further? Well, these latest NHS debate(s) have not matured yet, least because policy changes have not yet bought new evidence to analyze. This may explain why it hasn’t made headlines recently. Nonetheless, for those outside of the politicking, this should mean looking for the upcoming risks and the opportunities to make the best of a bad situation. A ‘mid-term’ report on the coalition government’s health policy by the leading Think Tank -The Kings Fund- also highlighted some opportunities the latest restructuring may offer. The focus on outcomes could drive further improvements in clinical effectiveness. New duties on integration could have positive impact on the management of long-term conditions and care of frail older people. Greater transparency of data could motivate organisations and clinicians to focus on improvement and to learn from each other. More liberal minds focused on the value of public service and collective action (a la ‘One Nation’) may say the expression “if it ain’t broke, don’t fix it” doesn’t apply to conservatives walking around with hammers. Sage NHS minds may agree (if they’re not the one and the same) and say the NHS hasn’t been helped with £1.6bn being diverted away from patient care to back-office restructuring. It’s critical the best is made of a potential worsening situation and one of the opportunities this restructuring may provide is for reduction of health inequalities. At the risk of over-extending the Old Western metaphor, local authorities have been given bigger wagon wheels (i.e. greater roles). So, as a King’s Fund mid-term report puts it, ‘this could lead to greater efforts to tackle the wider determinants of health and reduce inequalities’. It appears David Cameron was more concerned with changing the Tory brand and so made promises on the NHS he has no strong desire to fulfil. 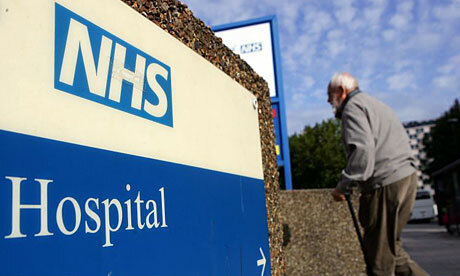 In the noisy and continuing debate over NHS reform, left-leaning minds with a genuine regard for a progressive NHS would do well to keep their trouble-shooting hats on and stay on the rodeo. Every commentator has a different take on how the new NHS will work and which new bodies will have the most power when it all kicks off in April 2013. The Young Fabian Health Network aims to support the formulation of policies that will reverse any damage done by 2015, so let’s make our voices heard. Members of the Young Fabian’s Health Network have the passion, experience and ideas to lead this. If you have an opinion, do get in touch either giving your thoughts in the comments section below or dropping us a line at healthnetwork@youngfabians.org.uk. The Health Network works best by pooling the ideas and thoughts of many different stakeholders together, so buckle up and think about getting involved. Yeehaw!